Liverpool ended a five-match winless run in style with a dominant display over a weakened Swansea City. 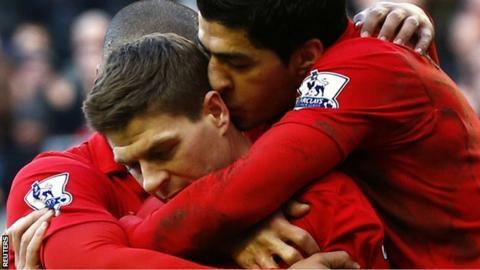 Steven Gerrard's penalty set Liverpool on their way when Kemy Agustien was ruled to have brought down Luis Suarez. Suarez then released Philippe Coutinho for his first Liverpool goal, before Jose Enrique finished a flowing move. Liverpool's superiority was rubbed in by Suarez's stylish solo score and a Daniel Sturridge penalty after Wayne Routledge handled in the area. Ex-Swansea manager Brendan Rodgers, who left south Wales for Merseyside in May, recalled Sturridge, cup-tied for Liverpool's midweek 2-0 Europa League defeat at Zenit St Petersburg, to his starting line-up. Daniel Agger and Lucas Leiva also returned, while midfielder Coutinho - an £8.5m signing from Inter Milan - made his Anfield debut. With one eye on next Sunday's Capital One Cup final against Bradford City, Michael Laudrup made seven changes from his side that humbled Queen's Park Rangers 4-1. Top scorer Michu was left on the bench, along with regular starters Ashley Williams, Angel Rangel, Routledge and Nathan Dyer. That saw winger Roland Lamah make his first league start for the Welsh side, while Israel striker Itay Shechter was asked to lead the line. Suarez tested Michel Vorm, firing straight at the Swans goalkeeper, while Stewart Downing and Glen Johnson also missed chances as the Reds retained a firm grip on the game. Liverpool had failed to score in any of the three previous Premier League meetings with Swansea. Suarez was twice brought down on the edge of the area, but first Gerrard and then Suarez were unable to find the target with free-kicks. Sturridge wasted a golden chance, getting under his header six yards out after Downing had beaten Ben Davies down the Liverpool right. Coutinho then missed the chance to open his account in front of the Kop, picking up a loose ball after Sturridge had driven into the Swans area but putting the ball just wide. The breakthrough came after Agustien appeared to clip Suarez's ankle in the area, referee Howard Webb pointing to the penalty spot after assistant Mike Mullarkey flagged for the offence. Gerrard, who had missed a penalty in the home loss to West Bromwich Albion, held his nerve and just beat the plunging Vorm low to the keeper's right. That was the first goal Swansea had conceded to Liverpool in their three previous Premier League encounters, but a second, third and fourth followed in the opening 11 minutes of the second half. First Suarez released Coutinho and the Brazilian surged past two defenders before beating Vorm with a cool finish. Coutinho was then just wide with another attempt before Sturridge, Suarez and Enrique combined with a mesmerising move down the left. The ball was pinged between bemused Swansea defenders to set up Enrique, drifting inside, to power his shot into the roof of the net from close range. Swansea's early resolve and discipline had dissolved under the flurry of goals and Suarez was able to jink past Kyle Bartley and Garry Monk before picking his spot for Liverpool's fourth. Routledge had come off the bench for Swansea but unfortunately for the visitors the winger conceded a penalty for handball when he challenged Suarez for a lofted pass. Gerrard generously gave the spot-kick to Sturridge, but the result was the same as the former Chelsea man slammed the ball past Vorm. Liverpool were playing their third game in seven days, having lost 2-0 on Monday at home against West Brom before losing in Russia on Thursday in the first leg of their Europa League last 32 game with Zenit St Petersburg. But this match ended on a sour note for the hosts as striker Fabio Borini, who only came on as a 78th minute substitute, landed badly in a challenge and dislocated a shoulder, an injury that will rule him out for the rest of the season. The Italian, signed for £10.5m from Roma in July, left the field screaming in agony as the Reds ended the match with 10 men after already making their three substitutions. Liverpool's victory saw them climb above Swansea into seventh place but the Swans must regroup for their Wembley encounter with Bradford next Sunday as they bid to claim their first major trophy and a place in next season's Europa League.